With a whole-hearted belief in practicality and artistry, Japanese brand NexusVII have humbly adopted a narrow approach to creating garments that precisely reflect today’s modern gent. Utilising heritage fabrics whilst drawing design inspiration from their strong cultural background, Owner/Creative Director Tomohiro Konno has carefully crafted a menswear brand that continuously strives and succeeds in producing refined collections season after season. With the formal arrival of autumn, the brand has released their AW13 range in requisite time for that inevitable battle with the season’s frigid chill. Employing a muted autumnal palette of olive and khaki, durable materials such as sherpa, leather and wool have been incorporated into the line as the functional element in this otherwise polished offering. With a clear emphasis placed on practical outerwear pieces, the brand beautifully construct an assortment of cold weather stand outs, such as a timeless black structured leather blazer, an on trend camo printed inner lined wind cheater as well as an innovative interpretation of a printed, fabric-blocked Harrington-style jacket, to name but a few. 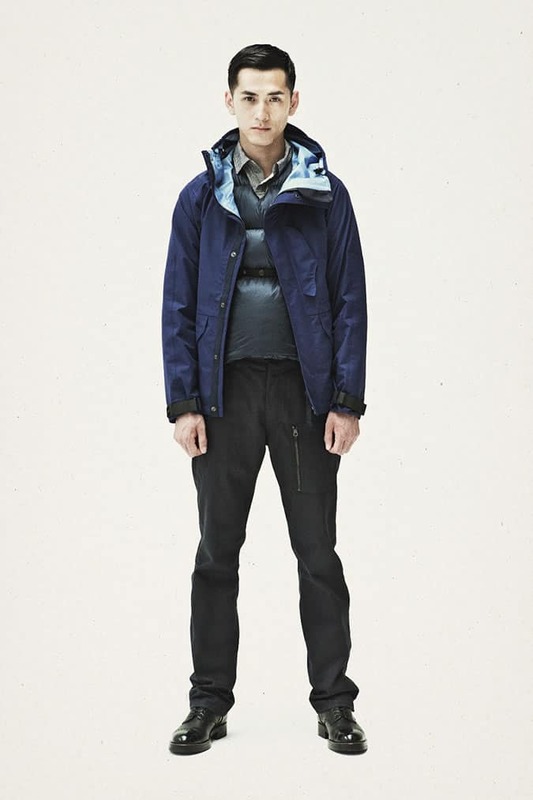 Experimenting with varying proportions and silhouettes, the accompanying utilitarian-inspired lookbook boasts a dapper mix of ensembles that cleverly showcase skillful layering techniques. Functional jackets and coats are carefully meshed with button-downs, weighted shirts, puffer vests and fitted trousers, helping to create a slick gentlemanly aesthetic. Providing sound proof that plummeting temps do not excuse hiding under shapeless winter garments, NexusVII offer an inspired season sensitive campaign filled to the brim with classic staples.